For the first time in its history, Porsche will introduce a plug-in hybrid as the flagship of its model line. The 2018 Panamera Turbo S E-Hybrid takes its power from the automaker’s turbocharged 4.0-liter V-8 and combines it with an electric motor to make a hype-sedan worthy of the name. The new Panamera lineup makes its world debut at next month’s Geneva Auto Show. The Turbo S E-Hybrid power team delivers a total of 680 horsepower and 626 pounds-feet of torque. The power combo provides acceleration that is in the hypercar category, 0 to 60 in 3.2 seconds – 3.3 for the Executive model. Top end performance is 192 mph. However, given the factory’s penchant for being a bit conservative, it is more than likely that the top is in the 205 mph vicinity. Only the limited production 918 Spyder has ever offered more power, Porsche said. Using European figures, the New European Driving Cycle puts average fuel consumption in the 2.9 liter-per-100-kilometer club. Environmental Protection Agency (EPA) numbers will be available later this year. As to all-electric performance, the automaker says the Panamera can drive on its battery for up to 50 kilometers (about 41 miles). The Turbo S E-Hybrid is Porsche’s second demonstration of the performance advantages offered by hybrid technology. 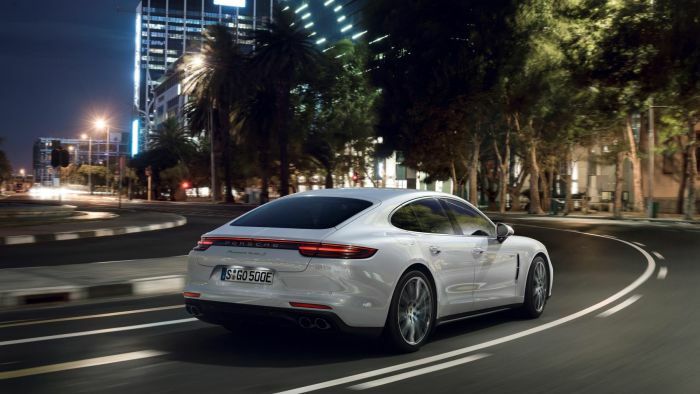 The first, the Panamera 4 E-Hybrid combines an electric motor with a twin-turbo V-6 engine. The technology comes from the 918 Spyder which uses an electric motor combined with the power of a twin-turbo-boosted V-8. Specifically, a decoupler, installed in the Porsche hybrid module, is activated electromechanically by an electric clutch actuator (ECA), like the one used in the Panamera 4 E-Hybrid. The ECA ensures quick response and excellent comfort. Like other Panamera models, the quick-shifting, eight-speed Porsche double-clutch transmission sends power to the active all-wheel-drive system with Porsche Traction Management. A liquid-cooled lithium-ion 14.1 kWh battery provides electrical energy. Charging via a standard 120-volt, 10-amp connection takes 12 hours. Using the 7.2 kW onboard charger, the charge time is less than three hours with a 240-volt, 40-amp connection. A smartphone app can begin charging. Three basic ideas underpin the Panamera series, performance, comfort and efficiency. The electric motor-turbo gas engine combinations guarantee performance. Comfort comes from an air suspension system that allows for a balance between a luxury sedan and a performance sports sedan. For efficiency, the Panamera takes advantage of its power systems. It starts in full-electric mode until the battery drops below a certain voltage. At that point, the sports sedan shifts to “Hybrid Auto,” where the total system is available for power. Prices start at $184,400 for the Panamera Turbo S E-Hybrid, while the Executive starts at $194,800.